Cashback Reward : Earn up to 31$! 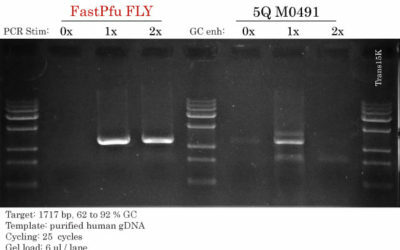 An unique genomic DNA remover is combined with EasyScript First-Strand cDNA Synthesis SuperMix to achieve simultaneous genomic DNA removal and cDNA synthesis in one tube. After cDNA synthesis, gDNA remover and reverse transcriptase are inactivated by heating at 85°C for 5 seconds. Simultaneous genomic DNA removal and cDNA synthesis in one tube to minimize RNA contamination. After cDNA synthesis, gDNA remover and reverse transcriptase are inactivated simultaneously. Compared with the traditional pretreatment of RNA with DNase I method, this method avoids RNA damage caused by high temperature inactivation of DNase I before cDNA synthesis. RNase inhibitor is included in the mix. 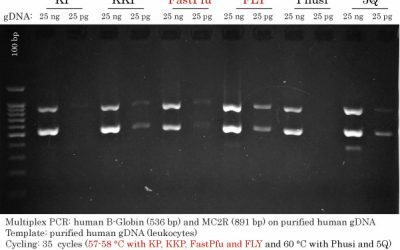 Synthesis of cDNA up to 8 kb.